The possession of more than 10 grams of marijuana is still a crime in Illinois. Under previous law, possession of less than 10 grams of marijuana was a Class B misdemeanor which carries a maximum punishment of 180 days in jail and a fine up to $1,500. Possession of less than 10 grams is now covered by the new law which makes it a civil offense. If you are caught with more than 10 grams but less than 30 grams of marijuana, you could be facing a Class A misdemeanor which carries a maximum penalty of up to one year in jail and a fine up to $2,500. A second such conviction is a Class 4 Felony. If you are caught with more than 30 grams of marijuana but less than 500 grams, you could be facing a Class 4 felony which carries a maximum penalty of 1 to 3 years in prison with probation a possibility. If you are caught with more than 500 grams of marijuana but less than 2000 grams, you could be facing a Class 3 felony which carries a maximum penalty of 2 to 5 years in prison with probation a possibility. If you are caught with more than 2000 grams of marijuana but less than 5000 grams, you could be facing a Class 2 felony which carries a maximum penalty of 3 to 7 years in prison with probation a possibility. If you are caught with more than 5000 grams of marijuana you could be facing a Class 1 felony which carries a maximum penalty of 4 to 15 years in prison with probation a possibility. James Dimeas is a nationally-recognized, award-winning, Possession of Marijuana lawyer. 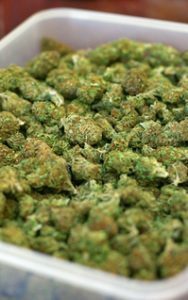 James Dimeas has been handling Possession of Cannabis cases throughout Chicago, Cook County, DuPage County, Kane County, and Lake County for over 25 years. James Dimeas has been recognized as a “Best DUI Attorney.” Expertise has named James Dimeas a “Best Criminal Defense Lawyer in Chicago.” The American Institute of Criminal Law Attorneys have named James Dimeas a “10 Best Attorney for Client Satisfaction.” The American Society of Legal Advocates have named James Dimeas a “2018 Top 100 Lawyer.” The National Trial Lawyers have named James Dimeas a “Top 100 Criminal Defense Trial Lawyer.” AVVO rates James Dimeas as “Superb”, the highest rating possible for any lawyer in the United States. If you are being charged with Possession of Marijuana, you can contact James Dimeas anytime for a free and confidential consultation. You can always talk to James Dimeas directly by calling him at 847-807-7405 for a personal consultation. Illinois Cannabis Control Act, 720 ILCS 550/4. Medical Marijuana Patients Beware: You May Have a Bulls Eye on Your Car, by James G. Dimeas, Chicago Criminal Lawyer Blog, December 2, 2017.